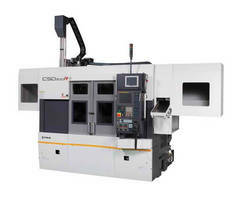 Vernon Hills, IL - Taking its CSD Series of lathes to the next level, FUJI Machine America Corporation has equipped its new CSD-300R with live tools for the fastest machining in its class. This twin spindle, twin turret lathe can in one setup achieve turning, milling and drilling in just 21.2 seconds from start to finish. For the fastest loading/unloading in its class, the CSD-300R boasts a Fuji-engineered hydraulic clamping robot loader with optimal robot paths. Heavy parts up to 7.87" x 4" Diameter, 5kg + 5kg are quickly and easily seated and transferred. Robot alignment to spindle centerline is achieved with the CSD-300R's robot control. The CSD-300R turret achieves speeds of 0.26 sec. / index. Dual 100mm spindles (A2-6) are equipped with 15 / 20 hp high output spindle motors. The CSD-300R's heavy-duty Z- and X-axis box ways (with no quill for the Z-axis movement) allow for extreme rigidity and accuracy. User-friendly features include a between-turret swing door for easy operator access, a rear (or optional side positioned) discharge chip conveyor, and maintenance items all conveniently located in one section on the machine. FUJI also offers a large capacity CSD-400 version of this twin spindle lathe. Both versions will be on display at IMTS in Booth #S-9059. FUJI turns the machining of a part into process perfection. When you contact FUJI, the part you will be machining is analyzed by engineers with vast experience in process and manufacturing engineering. With the largest install base at the major automotive manufacturers, FUJI engineers apply their experience with the FUJI machines that are built for automation from the ground up. These highly accurate machines employ built-in robotic automation, in-process auto gauging for quality control, and are engineered with the finest FUJI custom workholding, all from one source. This allows FUJI engineers to guarantee takt time, cycle time and Cpk with turnkey and run-off solutions that are built for lean manufacturing. Using less manpower and more automation, FUJI machines produce the highest quality parts most efficiently and reliably. FUJI solutions are supported by factory-trained engineers 24/7. For more information, visit IMTS booth #S-9059, log on to www.fujimachine.com or contact FUJI Machine America Corporation, 171 Corporate Woods Parkway, Vernon Hills, IL 60061, Phone: 847-821-2432, Fax: 847-821-7815, email: info@fujimachine.com. Mill-Turn Center machines large parts and long workpieces.